Today started the long drive back to school, from Maryland up to Halifax, Nova Scotia, by way of Gray and Bangor Maine. We take the drive to Gray, Maine every other year or so, to stay at the old family camp, but have always timed it wrong to make the stop in Portsmouth for the legendary lunch wagon. A vintage photo from my collection of Gilleys with owner Bill Kennedy. If I recall correctly, the article is from 1957. 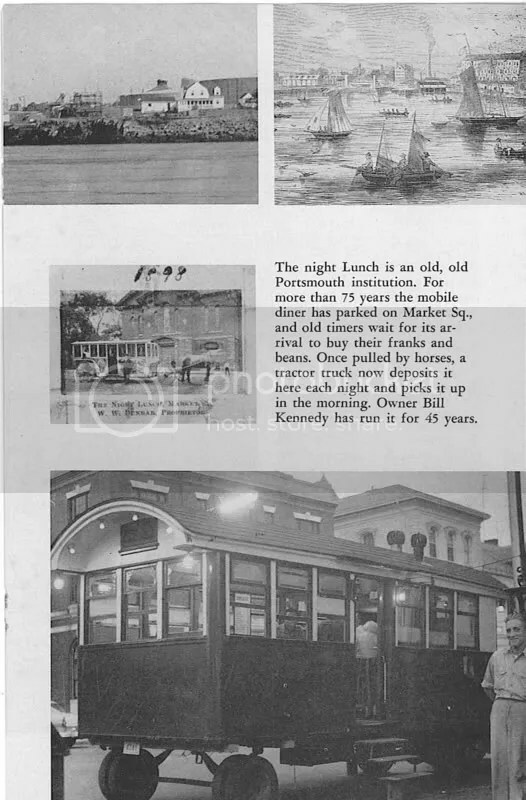 Caption states: “The Night Lunch is an old, old Portsmouth institution. 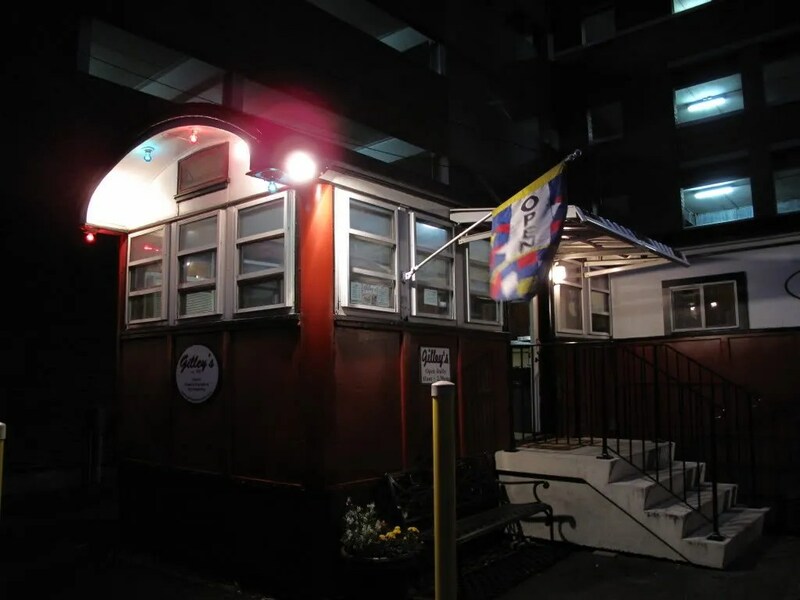 For more than 75 years, the mobile diner has parked on market sq. and old timers await its arrival to buy their franks and beans. Once pulled by horses, a tractor truck now deposits it here each night and picks it up in the morning. Owner Bill Kennedy has run it for 45 years. 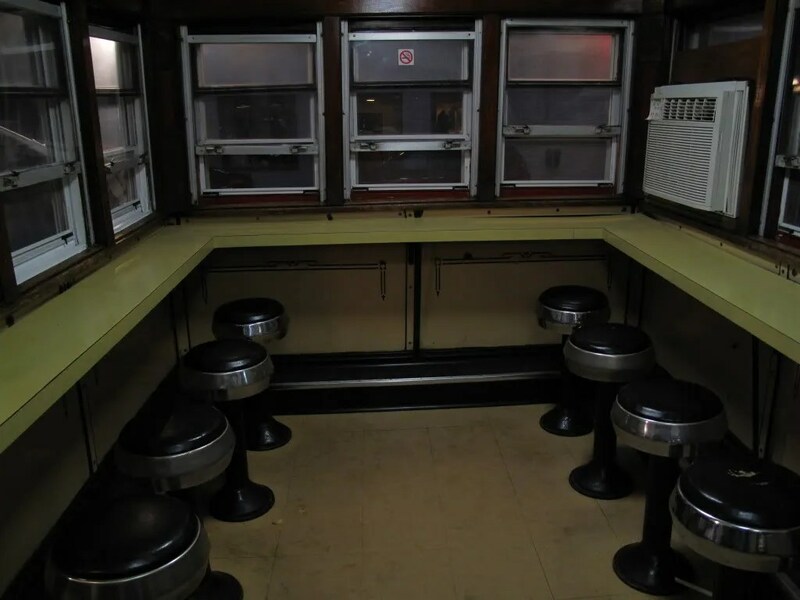 The current diner was built c.1940 by the Worcester Lunch Car Company, and stays true to the earlier style lunch wagon floorplan, with the small kitchen on one side, and a couple of stools on the other. It was originally brought to the square and left. Later, it was mounted on a truck, upon which it still rests, although its traveling days are over. A complimentary barrel roofed addition was attached to the right hand side of the car in 1996. 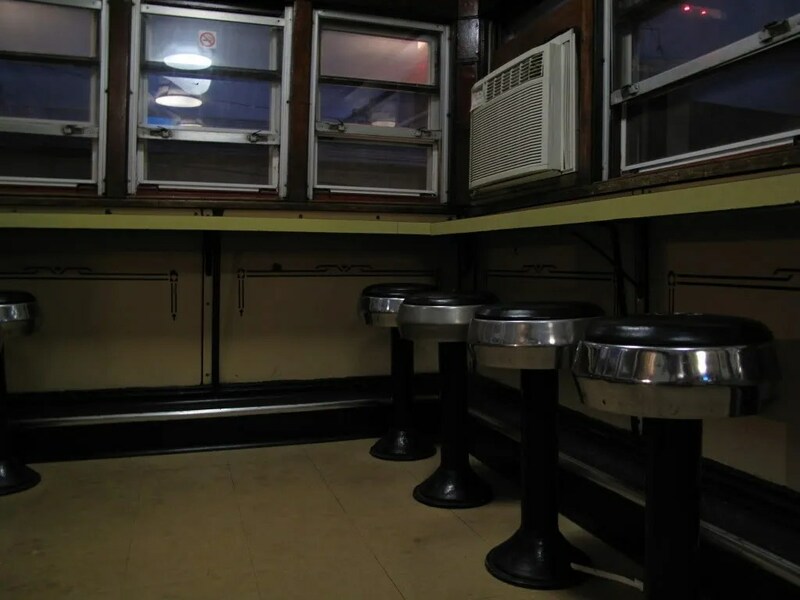 The diner is in remarkably good shape, retaining it’s original wood and enameled panels inside. The beautiful original vent hood still gleams. 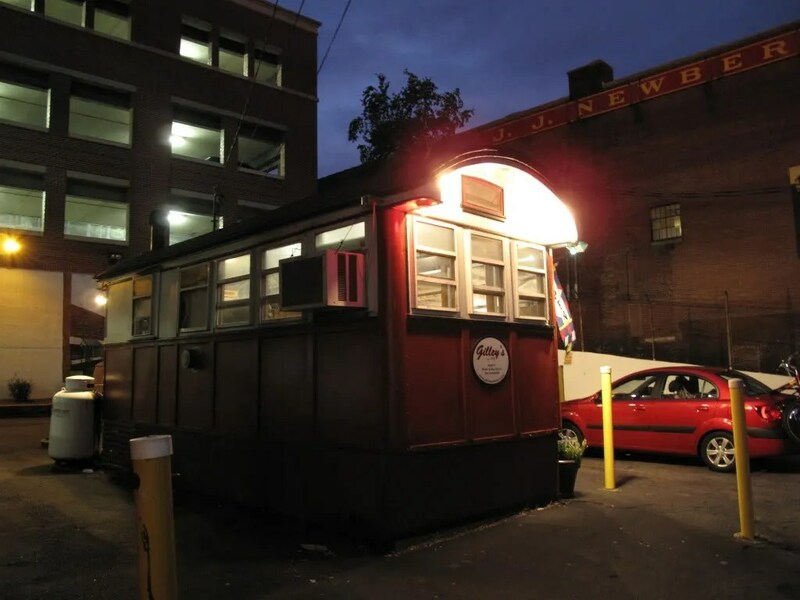 As it has for nearly a century, the diner still turns out good food, inexpensively, and is open late. The menu is limited, as it should be, to what can be cooked behind the counter at the grill. Hamburgers, dogs, grilled cheese, fries, etc. I ordered the chili cheese dog. Excellent natural casing dog, with a nice crisp to it when bit, on a squishy bun, covered in chili. It was almost impossible to eat without wearing it, but oh so delicious. 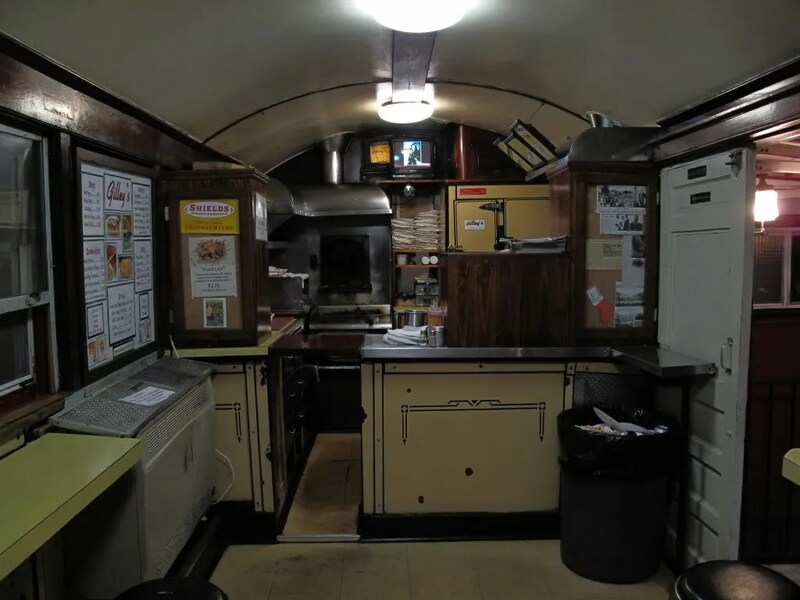 Friendly place, great food, served in a rare and well preserved lunch wagon. What more could I ask for? This entry was posted in Diners / roadside related, Diners/ restaurants, Worcester and tagged 1912, 1957, diner, Gilley's, lunch wagon, Navy, New Hampshire, NH, night lunch, Portsmouth by Spencer Stewart. Bookmark the permalink. Shamefacedly I admit to walking past Gilley’s a few times en route from parking garage to destination, but never stepped inside. 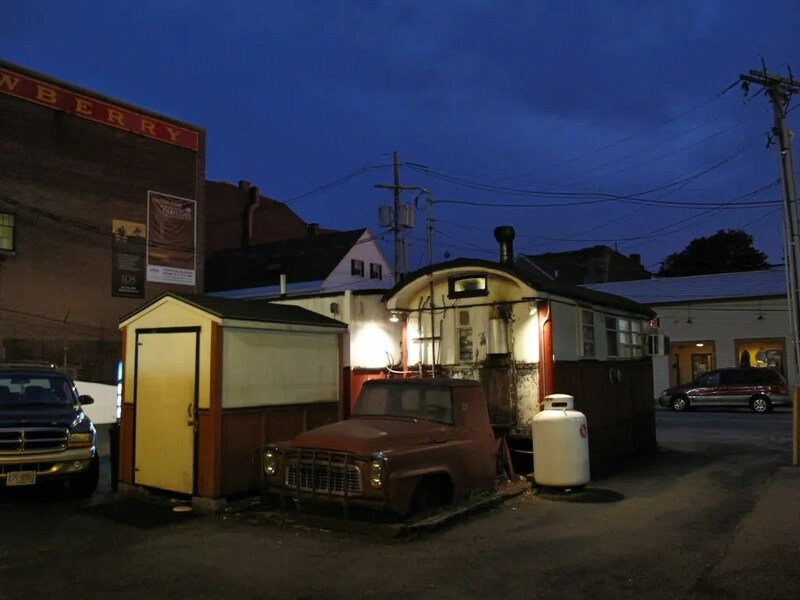 I think my excuse was that I was on my way to Friendly Toast, but now your photos make me want to return to Gilley’s and add it to the Retro Roadmap too! Portsmouth is a neat little town. 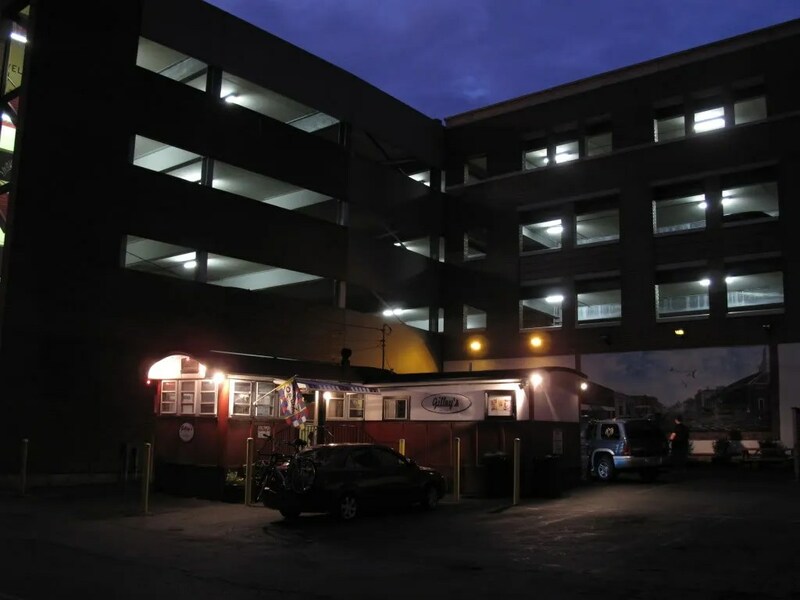 There used to be an old apartment building that Gilley’s backed up to and I lived there briefly when I was stationed at the Navy yard back in the early 80’s. I’m sure the parking structure is an improvement!